If I were a pirate, I would probably steer my ship towards whichever port served up the juiciest Caribbean pork burger. Perhaps, if I were an entrepreneur in the 18th century, I would even open the first drive-through that could accommodate Frigates just to serve up these glorious burgers to happy pirates. I suspect they get fairly hungry with all that plundering and whatnot. Plus, it would just be cool to have a treasure chest as a cashbox for all my booty. At the end of each day, I would simply bury it in the sand, and mark the spot with an X so I knew where to dig it up next time I open the restaurant. Though, I suppose I should make sure each of my shift managers has a treasure map to find it. Oh, what a fine adventure it would be! Well, unfortunately, my high school guidance counselor was probably right, I’ll never fulfill my dream of opening a restaurant in the 18th century that serves pirates. However, I can still make the greatest pork burger recipe the world has ever known. That’s just as good, right? I make a lot of homemade burgers, most are traditional beef burgers, though, I make a great venison burger as well. However, pork is an often overlooked protein that makes a phenomenal burger too! The ground pork you can purchase in the grocery store already has plenty of fat blended into it to ensure a flavorful and juicy burger. In case you are wondering, 20% fat it typically what I aim for. If you are an overachiever and grind your own pork, I recommend grinding a pork shoulder for burgers. The secret to making an exceptional pork burger is in the seasonings. Unlike a traditional beef burger, pork burgers are typically heavily seasoned with spices because of their otherwise mild flavor. This makes the quality of your seasoning paramount for success. Jerk seasoning is my favorite flavoring spice for pork burgers. I recommend blending two tablespoons of high-quality Jerk Seasoning (affilate link) with one pound of your ground pork. Assuming the jerk seasoning is salt-free, you will want to add salt as well. If you purchased a jerk seasoning that is already blended with salt, do not add more or your burgers will likely be too salty. The other key to bringing any dish to the next level is not missing a chance to add flavor wherever possible. 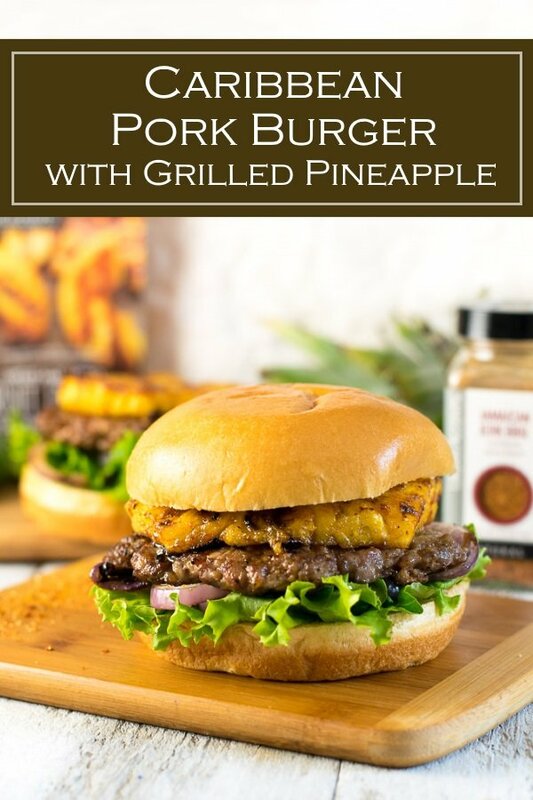 Topping your pork burger with grilled pineapple is a perfect complimenting flavor. Yes, I said grilled. 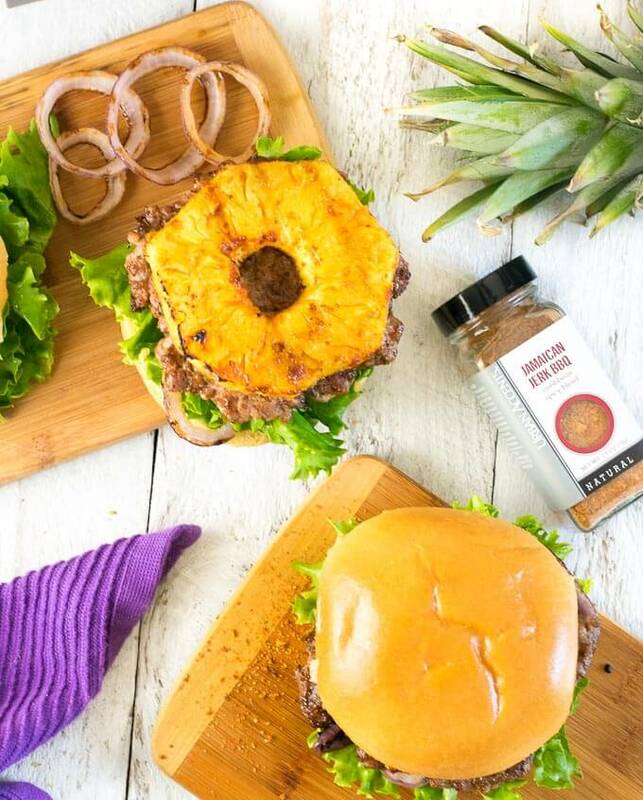 Grilling the burger and pineapple adds the most flavor. However, you can certainly make this inside in a skillet instead. Grilled or sauteed onions are also a nice contrasting flavor for the pineapple, I recommend red onions. This is a fresh tasting burger, so I don’t feel it needs cheese. If you decide it must be topped with cheese I would use a spicy pepper jack. Mayo is always a safe choice for any pork burger, particularly this Carribean inspired pork burger. However, you can spice up the flavor even further by adding habanero hot sauce with the mayo. If you are really feeling adventurous, try my Ghost Pepper hot sauce! You can dab the hot sauce on as desired, or mix it with the mayo to create a flaming hot condiment! If you don’t like the extra heat, just omit the hot sauce completely. 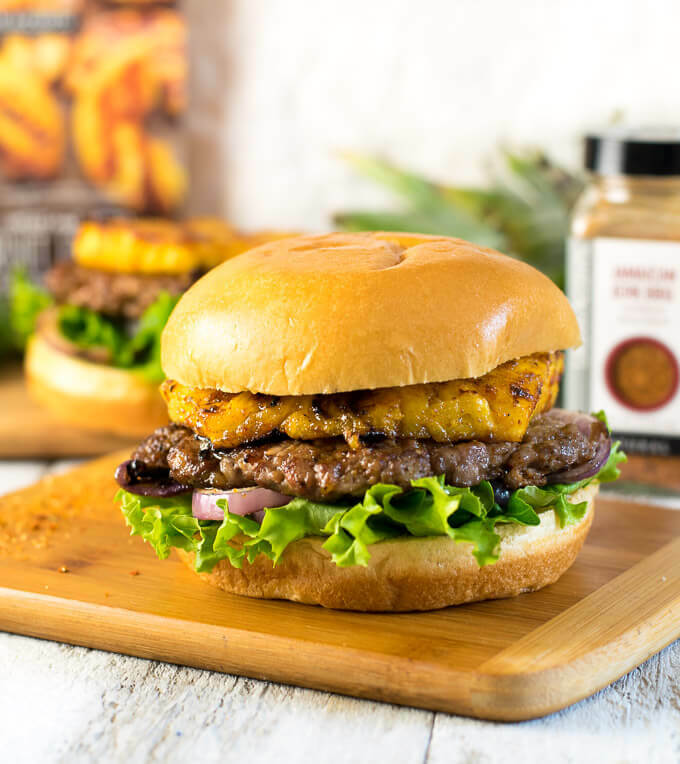 My mouthwatering Caribbean Pork Burger with Grilled Pineapple is infused with bold jerk seasonings and topped with juicy grilled pineapple for a big taste of the Islands your whole family will love! Sprinkle jerk seasoning and salt on the ground pork and gently mix to combine, being careful not to overwork the meat. Divide meat into 3 balls and form into flat round patties. Place pork patties, pineapple, and onion rounds in a hot skillet, or on the hottest part of the grill and cook for 2-5 minutes. Flip before bottom burns and continue to cook till heated through. The onions should be soft and tender when cooked, the pineapple should still be firm but heated through. 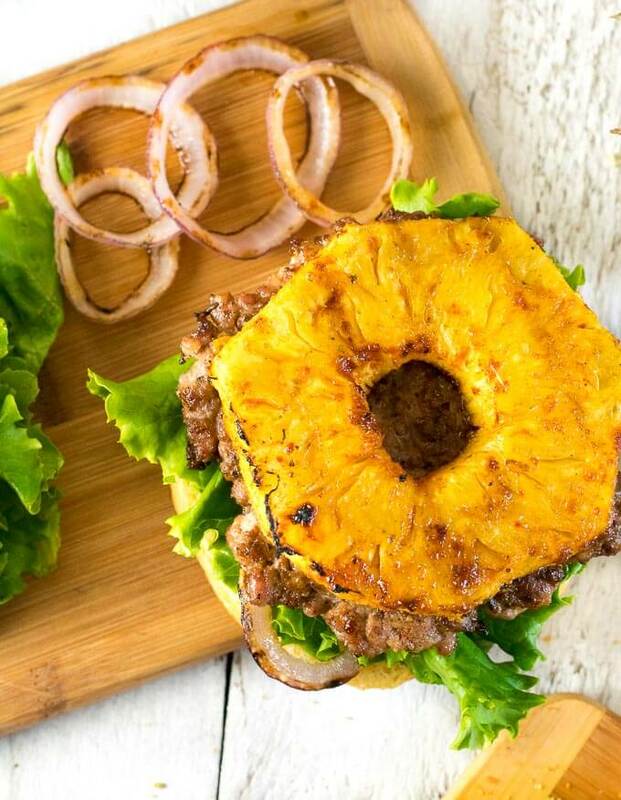 Assemble burger by adding lettuce to the bottom bun, top with pork burger, onion, and pineapple. Add choice of condiment and serve. If you liked this recipe you will also love my Roasted Pork Sandwich. This recipe was originally published on FoxValleyFoodie.com June 19, 2017. 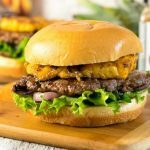 If you enjoyed reading my Caribbean Pork Burger recipe then you should probably like me on Facebook and follow me on Pinterest too. That’s what I would do at least, because if you don’t get to know me but you still use my recipe it is kind of like taking candy from a stranger, and your mom taught you not to do that. Don’t disobey your mom, subscribe to Fox Valley Foodie today. 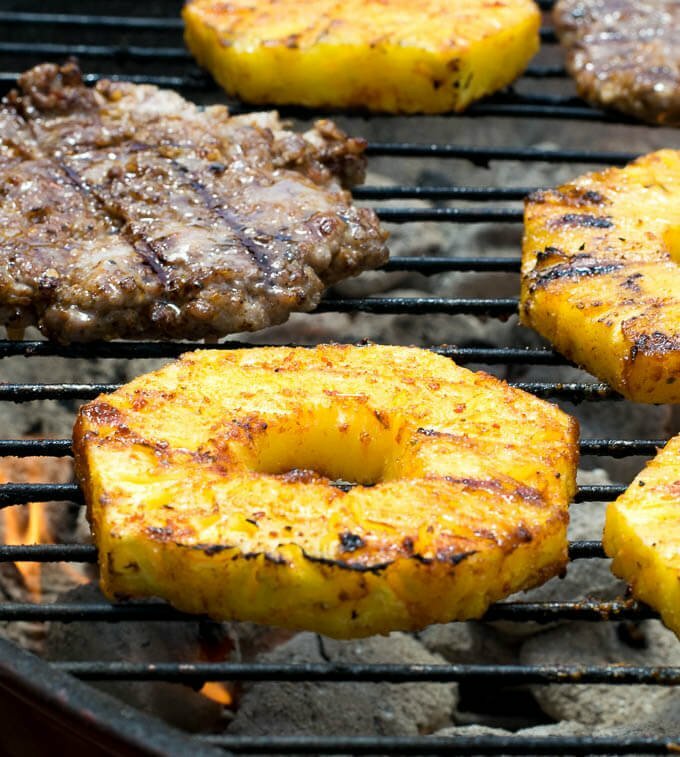 Grilled pineapple on eeeeverything and anything, please!? This pirate burger looks ARRRRmazing! Too cheesy? Thought so. OK, you won me over. This is my new favorite burger!